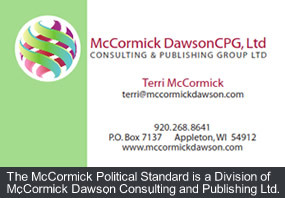 “I believe that anyone working in the government sector or government consulting field needs to be accountable and effective in this current economy,” states Terri McCormick, author, policy expert, educator and former state representative to the Wisconsin State Legislature. 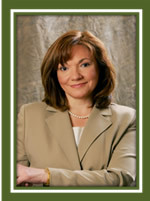 Today, she offers her expertise in public and government relations through McCormick Dawson CPG Ltd., a trusted consultancy of independent contractors. 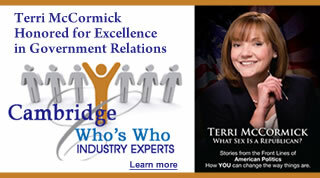 Terri McCormick serves as president and CEO of the company, drawing from more than two decades of professional experience, a strong educational foundation, and a host of industry –related publications, and a multitude of accolades, awards and formal recognitions. Ms. McCormick holds a Master of Arts in administrative leadership from Marian University, and a Bachelor of Science in political science and public administration from the University of Wisconsin. She received both degrees with high honors. In light of her achievements, Ms. McCormick is grateful to her first mentor, Col. Harry Mathos, who taught her by example to continually strive to the highest bar. She created and garnered support for Wisconsin’s First Charter School laws, which created and executed programs that improved the performance of individuals in classrooms and institutions. 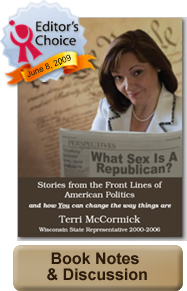 Ms. McCormick was elected to the Wisconsin State Assembly in 2000, and for six years she worked to pass laws regarding manufacturing, regulation and healthcare reform, and capital investment.